Don’t save a penny to lose a dollar! We came, we saw, we conquered! We came like fresh Breeze and revamped the entire embroidery digitizing scene. It took us a decade to set new quality, discipline and affordability standards. Qualiity Digitizing (as the common misconception goes) is not just a random manufacturing step but its equivalent to laying foundation of a building. One little error and you could destroy the whole lot. So the wise choice is to invest in professional digitizing services and work towards a perfect product. Our diverse and qualified team of professionals produce the digitized results which are not only perfect in quality but meet your perspective and customized requirements as well. We create enhanced details, sharper designs, less thread breakage and less wasted materials, thus ensuring faster production runs to meet your deadlines. Unbeatable Price: Pricing is based on per 1000 stitches which is called stitch count pricing structure. It is the only pricing structure that gives you “bang for your buck”. Stitch count based price is best for simple as well as complex artworks. Rush Jobs: With in 2 to 12 hours with a bit extra cost. Free Quotes: Price estimates and stitch counts are provided within 2 to 24 hours after getting your request with details. Finished designs may vary up to 15% more or less in stitch count. Free Editing: Edits (if not different from originally ordered) are done free of cost. Easy Payment: We accept PayPal and Credit Card payments via 2Checkout.com. We also accept wire transfers on payments that are greater than $500. For more details on how to pay, please read our faqs page. Unless instructed by you, we provide digitized file in DST format but we can also provide digitization files in EMB, EXP, CND, DSB, DSZ, KSM, T01, T03, T04, T05, T09, EMT, TAP, SEW, JEF, HUS, PES, PEC, PCS, PCD, PCQ and CSD formats. If you need your digitized file in any of the above formats other than .DST, please mention it while contacting us. Embroidery machines that support above mentioned formats are Tajima, Barudan, Melco, Toyota, ZSK, SWF, Happy, Brother, Janome, PFAFF and many others. 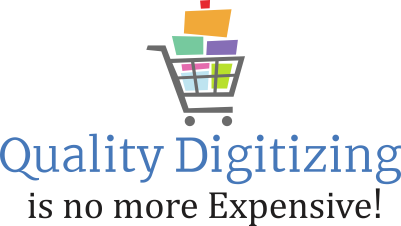 At Absolute Digitizing, we offer strict quality control measures with our client’s total satisfaction in mind. Should your digitized design not meet your expectations of quality embroidery digitizing; standards based on the machine (s) you use; the products on which you intend to run; or even the way you prefer to run your designs, we will edit the digitized design absolutely FREE (within 1 month upon delivery). However, should there be changes to the original purpose, size or integrity of the digitized design, nominal editing charges will apply.